The pork bistek is a variant of the Bistek Tagalog, or a sauced lean beef dish with calamansi or lemon juice and soy sauce. Lean cuts of pork sliced thinly is marinated in a tangy and salty mixture of lemon juice and soy sauce. And just in the Beef bistek, onions cut into rings and used as topping. 1 Mix the lemon juice and soy sauce. Marinate the pork for 30 minutes inside the refrigerator. 2 When ready, wring out the excess liquid and set aside. 4 Pan-fry the pork in batches, cooking it for about 2-3 minutes per side. Once they are all done, add in the marinade, water and ground pepper. 5 Let it simmer for 20 - 30 minutes or until the pork is tender. Add enough water so it won't dry out. 6 Serve with the onions on top like garnish. Perfect with a plate of hot white rice. For a more tangy Pinoy bistek, marinate the pork for up to 4 hours. Sugar helps balance the salty and tart taste of the sauce, but you could leave it out, too, if you want. To easily cut the pork into desired thickness, you could freeze it for about 2 hours before slicing. 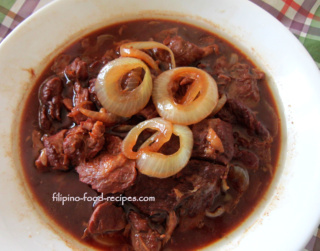 For a more tender pork bistek, use the back of the knife to pound the sliced pieces of meat just before marinating. 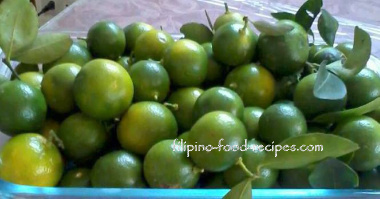 Originally, this dish is done with Calamansi, which is more like the lime, rather than lemon. It is smaller and more tart and not readily available. Some Filipino stores sell the quite pricey frozen juices in small packets.